14 June 2012. 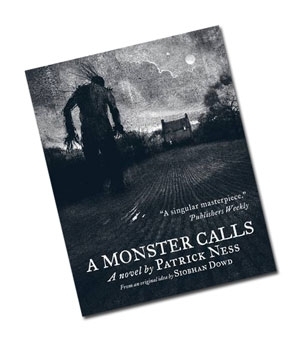 A Monster Calls by Patrick Ness has won the 2012 Carnegie Medal AND 2012 Kate Greenaway Medal. This is the first time, in the awards 75 year history, that one book has won both prizes! Rachel Levy chair of the 2012 CILIP Carnegie judging panel said: "A Monster Calls" is an exquisite piece of writing. It is a beautifully economical, structurally brilliant and lyrically descriptive account of a challenging episode in one child's life." of A Monster Calls, and all of the other books shortlisted for the Carnegie and Greenaway Medals, exclusively, on Lovereading4kids. Prize-winning Patrick Ness displays brilliant new skills of sensitivity in this hauntingly touching story of how a boy deals with the looming threat of his mother’s death from cancer. Haunted by a monster in his dreams, denied much information by his family and treated as a weirdo by his class mates and a ‘special case’ by his teachers, Conor struggles to get to grips with the devastating emotions which threaten to overwhelm him. How he finds the courage and strength to face the end when it happens is both utterly shattering and deeply satisfying. Costa Award winner Patrick Ness spins a tale from the final idea of much-loved Carnegie Medal winner Siobhan Dowd, whose premature death from cancer prevented her from writing it herself.